WHEN he was just 12-years-old he created and sold his very own video game, displaying the first signs of the entrepreneurial streak that now 35 years later has made him one of the world's most famous capitalists. I'm talking about the Elon Musk, of course. It was a space-themed game called Blastar, where the objective was to destroy an alien ship filled with weapons of mass destruction and you can actually play it online. It probably didn't make him much money, but it wouldn't be long before the South African born Musk would start a venture that would earn him a serious crust. 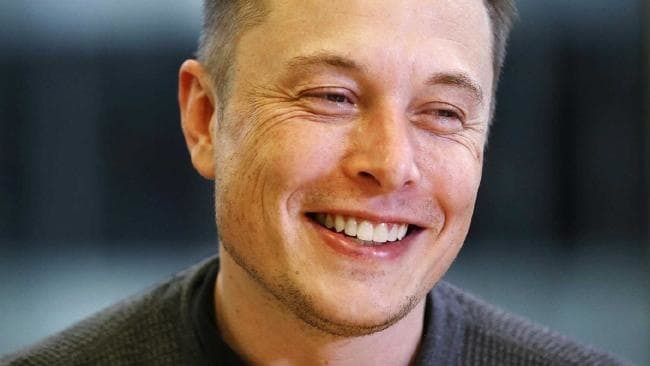 The 47-year-old billionaire is the CEO of Tesla and SpaceX but before he became a real life Dr Scorpio, he was responsible for companies that helped shape the early days of the internet. Sure Musk has behaved erratically in recent times (lashing out at critics and cave-diving heroes alike) as questions grow about the viability of his electric car company. But despite recent claims he is a fraud, Musk has a long list of achievements that put him on the path to being one of the richest men in tech - and these days, one of the most controversial. In 1995, Musk quit graduate school at Stanford University to co-found an internet start-up. Teaming up with his younger brother Kimbal Musk (who is now a restaurateur and agricultural entrepreneur), the pair started a software company called Zip2 that created digital maps and directories for online newspapers. "When my brother and I were starting our first company, instead of getting an apartment, we just rented a small office and we slept on the couch," Musk said in a 2014 commencement speech for a graduating class at the University of Southern California. The long hours and unorthodox living arrangement paid off handsomely when four years later the brothers sold it to early PC company Compaq for nearly $US300 million. Elon's share of the sale was the pretty tidy sum of $US22 million. He used about half of that money to co-found X.com, which he saw as a software platform for the future of online banking. The start-up later merged with a rival that had a similar plan and renamed itself PayPal. 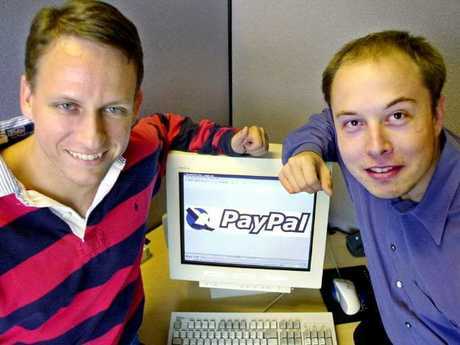 PayPal Chief Executive Officer Peter Thiel and founder Elon Musk pose with the PayPal logo at corporate headquarters in Palo Alto, California in 2000. You've almost certainly heard of PayPal but you might not be aware of just how influential the people behind it have become in the world of tech. The company has spawned three billionaires, many millionaires and a number of generation-defining companies. Alongside Musk in the early days of PayPal was Peter Thiel and Max Levchin. Peter Thiel has gone on to be a billionaire venture capitalist who was one of the earliest investors in Facebook, heads up a highly secretive data analytics company called Palantir, which is backed by the CIA, and is well known for trying to find a cure for ageing. Max Levchin went on to create a social gaming company called Slide, which Google later acquired for $US182 million and was also involved with the creation of popular online review site Yelp. Others involved in PayPal went on to help develop YouTube, LinkedIn and a raft of other highly valued and influential companies. In the process, the group came to be known as the PayPal Mafia. But of all of them, Musk is the most visible, and arguably, the most doggedly ambitious. When PayPal was sold to eBay in 2002, Musk made a small fortune (even though he opposed the deal), pocketing about $US180 million at the time. It was then he turned his attention and new-found wealth to the space industry and his new space exploration company, SpaceX. It was also around this time that he founded Tesla, in 2003 putting about $US90 million of his money into starting the two companies. Despite their lofty valuations these days, both companies are only alive "by the skin of their teeth", Musk admits. The entrepreneur told an audience earlier this year at the South by South West (SXSW) conference that both companies almost went bankrupt in 2008. "I gave both SpaceX and Tesla a probability of less than 10 per cent likely to succeed," he said during a Q&A session. "At the beginning in 2002, I wouldn't even let my own friends invest as I didn't want to lose their money." But a decade after they nearly collapsed, both companies are potentially on the brink of changing the world. And for his efforts, Musk is said to be worth about $27 billion.